61 years after Henry Reed was released from military service as a translator at Bletchley Park, the codebreaking continues. Radio signal 1851/19/252: F T 1132/19 contents: Forced to submerge during attack. Depth charges. Last enemy position 0830h AJ 9863, (course]) 220 degrees, (speed) 8 knots. (I am) following (the enemy). (Barometer) falls 14 mb, (wind) nor-nor-east, (force) 4, visibility 10 (nautical miles). 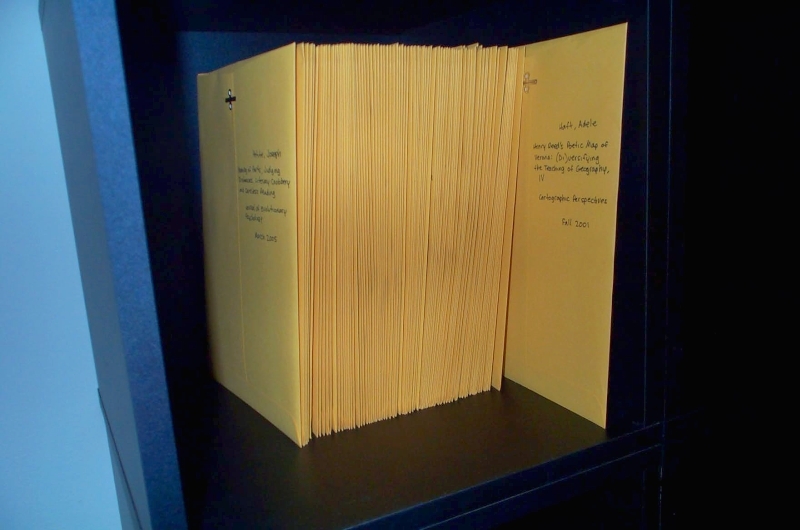 The three unbroken messages were originally presented as a challenge by Ralph Erskin, in a 1995 letter to the editor of the journal Cryptologia. The signals were intercepts from the North Atlantic in 1942, and are presumed to have been enciphered using Germany's M4 (4 rotor) Naval Enigma. You can join the fight to defeat the Axis powers by downloading the M4 Project's Enigma Suite. I hadn't played with Google Scholar for awhile, and it seems to me, since the last time I poked around, there are a whole lot more JSTOR articles that turn up now. Maybe it's just English journals which were added: stuff like The Review of English Studies, and American Literature. Am I wrong, or is this a (relatively) recent development? When did all that juicy JSTOR goodness get added, and where was I when it was announced? As an early-morning follow-up to yesterday evening's post, I should point out the British Library's Archival Sound Recordings Project, which, as a pilot program, has set a goal of digitizing 4,000 hours of audio recordings, and making them freely available to educational communities in the U.K. The project is funded by the Joint Information Systems Committee (JISC), which interviewed both the Head of the Sound Archive, and the Archival Recordings Project Manager back in 2005. Sample audio from the Sound Recordings Project includes the poet Simon Armitage reading "Entrance," Tolstoy's Waltz in F, and the call of the Tawny Owl (all links to Real Audio files). The full list of audio samples is on the project's "Listen" page. Could this be our Henry? It certainly sounds like him. A search for the quoted phrase brings up a Yale Review of Books article on the futility of deconstructing children's verse. The quotation is dropped during a discussion of a popular book on the history of nursery rhymes, Mother Goose: From Nursery to Literature (Gloria Delamar, 1987). Is this the source of the mysterious "Sir Henry Reed" quote? If it is, indeed, the Henry Reed, where does the titular "Sir" come from? Do you have this book in your library? Drop me a line at steef at solearabiantree dot net. Merhaba! I was startled today, browsing through some old book reviews, to discover that Henry Reed's Collected Poems has been translated into Turkish (Türkçe). The title is Yıldızlı Şölen, translated by the poet and linguist Coşkun Yerli. Yerli is a well-renowned translator in Turkey, having taken on the likes of Kobayasi Issa, Matsuo Bashō, Eavan Boland, Roger McGough, Sydney Wade, and James Lovett. He even tackled J.D. Salinger's The Catcher in the Rye and Nine Stories. Yerli has also published a collection of his own poetry, Yagmurun Direnisi ("Rain's Resistance"). Here's one of his poems in English, "In a Cloth-Bound Book." At last, progress. Most of the copies and printouts which had been languishing, unindexed, on the desk and coffee table have been filed in the open-shelf system; they were mostly Third Programme broadcasting schedules from the Times and Radio Times. True Noguchi-style, of course, wouldn't work for a bibliography, as sorting by author, title, and date is necessary to find a specific document. 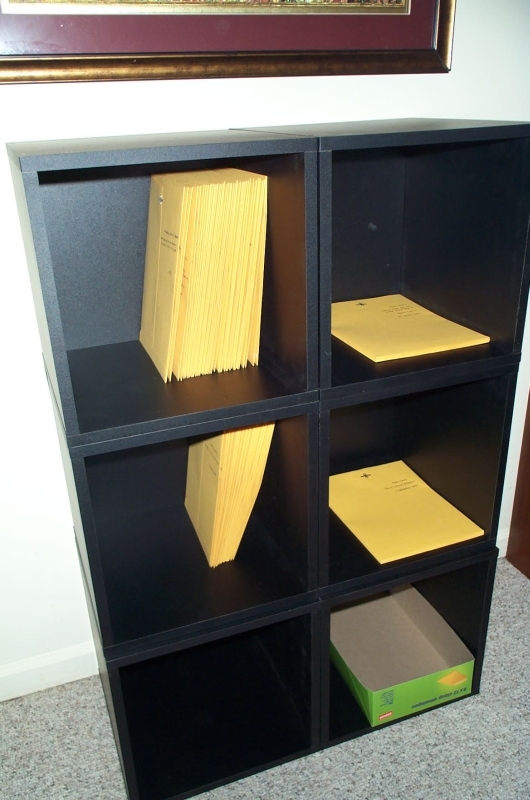 But I'm quite satisfied with the way the system works, and especially with the aesthetics: the orange-yellow of the envelopes against the black shelves. I dipped into the box containing Reed's essays and poems copied from periodicals, but progressed only as far as titles beginning with "D", before my initial burst of enthusiam wore down. Labeling and stuffing one hundred envelopes at a stretch seems to be about the limit of my endurance. In 1700 the Cottonian Library was deeded to the nation; and after it was decided that Cotton House was too damp and ruinous for the preservation of the manuscripts the collection was transferred to Ashburnham House, which, besides being dryer and more spacious, was thought to be "much more safe from fire." Two years passed; then, early in the morning of of October 23, 1731, the city of Westminster was aroused by the alarm of fire at Ashburnham House. The first men on the scene saw the flames burning brightly inside the room where Cotton's fourteen book presses stood. Among the crowd which gathered were trustees of the collection, who broke into the burning house, ran to the presses, and feverishly threw hundreds of volumes from the windows. Among these rescuers was Richard Bentley, the Cottonian librarian and the greatest classical scholar of his time, who is reported to have raced from the flaming house "in his dressing gown, a flowing wig on his head, and a huge volume under his arm." He had chosen for salvation by his own hands the precious Alexandrian manuscript of the New Testament. Meanwhile other citizens were laboring at the hand pumps brought by the primitive fire brigade. A few hours later, the portion of Ashburnham House that contained the Cottonian collection lay gutted. Of the 958 manuscript volumes in the library, about a hundred, virtually all irreplacable, were utterly destoyed; and hundreds more which survived were dreadfully charred and water-soaked. Some of these were restored with as much skill as was then possible, but there remained sixty-one bundles of damaged leaves, the sorting and repairing of which was to be delayed until the middle of the next century. Among the volumes which had escaped with minor damage was the unique manuscript of Beowulf, only the edges of which had felt the flames. You'd think moving a precious library into a building named "Ash-burn-ham" would've given someone ironic pause, but. Here are excellent some accounts of the Ashburnham House fire and the miraculous survival of the Beowulf manuscript. Early last fall, some months after going live with these pages, I was doing a bit of vanity-googling, to try and discern how I was progressing at enticing search engines to index the blog. In the course of those searches, I came across a paper entitled "Semantic Blogging and Bibliography Management" (Cayzer and Shabajee, 2003), which literally made me think about blogging in a whole different light. The basic idea is that a weblog, with its structured, common elements like links, author and title, categories and tags, is an ideal medium for creating and sharing bibliographic information. (Demonstrator blog, normal and "record card" views). Then, along came Google Base which, I admit, I completely didn't get at the time. It was like staring at an atlatl, trying to deduce its purpose without the benefit of having seen some practiced Cro-Magnon chuck a lance at a mammoth. "You want me to put my data where?" Then I found The History Librarian's bibliography of Georgia labor history, and Chris Karr's collection of H.P. Lovecraft copyright research, and I totally got it. You don't use Google Base to create a bibliography. It is a bibliography. All you have to do is add to it. Most recently in this same ilk (and via Librarian.net), there rises Casey Bisson's prototype library catalog, assembled out of WordPress' blogging platform and some nifty household appliances. (Holy Schnikes!) Jenny Levine has posted a nice summary of how the OPAC works at the ALA TechSource blog. This sort of terrible vision  the ability to look at the same tools everyone else is using and invent new applications  is awfully humbling. I'm pounding rocks into crude wheels, and all I can think to do with them is squash pesky mice.